Ms. L’s family first contacted us in December when she had recently been discharged from hospital. Ms. L who was 96, had never married and had until recently been living independently in England with her remaining family living in Edinburgh. 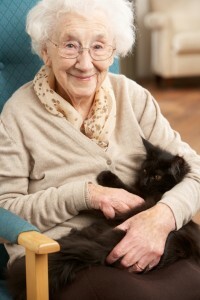 On her discharge from hospital she began receiving home care organised through social services. Despite the best efforts of the home care company the care she received wasn’t meeting her needs and we agreed that we would monitor the care until her scheduled care review, while supporting her family to look at different options including residential care. Unfortunately, after a couple of weeks at home Ms. L was readmitted to hospital where she was found to have terminal pancreatic cancer. At this point both she and her family wanted her to move to a nursing home in Scotland where she could be near them and well cared for at the end of her life. Although the family had found a home in Scotland, they and the hospital needed our help to get Ms. L to Scotland in time for Christmas. Clarity worked closely with the hospital, meeting with them to discuss Ms. L’s ongoing care needs and how best to get her to Scotland. We arranged for her care plan to be faxed to the care home and organised a carer to accompany Ms. L on her journey. We then met with the airline to arrange flights and agree support for Ms. L, both at departure and on arrival. An ambulance was also arranged to meet Ms. L at the airport in Edinburgh to take her to the care home. After a great deal of effort from everyone involved, Ms. L left hospital on the 23rd December and, to the relief of her family, arrived safely at her nursing home that evening. She enjoyed the Christmas holidays with her family and is now happy and settled in Scotland. If you need help finding care at home services for an elderly relative or friend, or are a solicitor representing elderly clients who could benefit from our Care Management services, please call Clarity Care Consulting on 02392 251351.